Subbulakshmi’s training in music began at a very early age under her mother Shanmukavadiver Ammal, a well-known veena player. New Delhi: M.S. 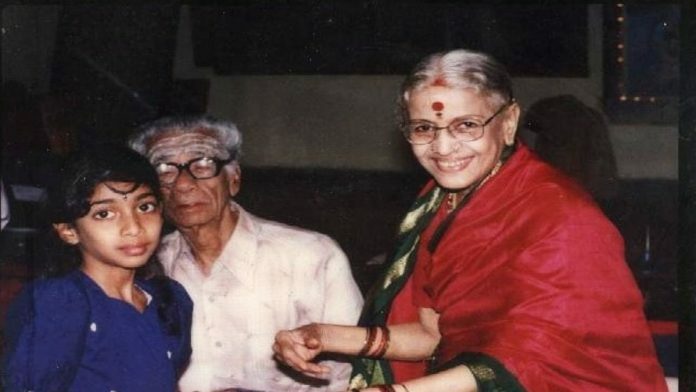 Subbulakshmi’s passion for her craft was absolute, and her humility phenomenal. It is said that when the Madras Corporation sought to rename the street where she lived in her honour, she refused, because fellow Carnatic giant D.K. Pattammal lived in the same neighbourhood. “If anyone’s name should be used, it should be Pattammal’s, she said, because she had lived there longer,” read a profile in Hindustan Times. Sunday, 16 September, marks the 102nd birth anniversary of Subbulakshmi, a titan of the Carnatic school of music who passed away 14 years ago, leaving behind a rich ouevre of gems her fans continue to swear by. Born in 1916 in a Tamil family of musicians based in Madurai, Subbulakshmi’s training in music began at a very early age under her mother Shanmukavadiver Ammal, a well-known veena player. She then learnt the various gradations and nuances of Carnatic music under the tutelage of legendary vocalist Semmangudi Srinivasa Iyer, and also dabbled in Hindustani music under the wing of Pandit Narayanrao Vyas. Subbulakshmi’s career as a singer started at the age 10, when her first recording was released. By next year, all of 11, she had delivered her first public performance at Triuchirappalli’s famous Rockfort Temple. She tasted the first stirrings of the fame she was to court all her life at 13, after a performance at Madras Music Academy. Some of her most notable renditions include Hanuman Chalisa, Kurai Ondrum Illai (composed by freedom fighter C. Rajagopalachari), and Bhajagovindam. At 22, Subbulakshmi also began a brief stint in cinema with the Tamil movie Sevasadanam, which was a commercial as well as critical success. She did five movies in all. In 1940, she married Sadasivam, who is said to be the person who introduced her to the world of Tamil cinema. It is said that MS, as Subbulakshmi is fondly called, played the role of Narada, a man, in the 1941 movie Savitri to raise funds for her husband’s Tamil weekly. Her role as the Rajasthani saint-poetess Meera in a 1945 movie of the same name brought her national recognition. MS had also sung the popular Meera bhajans that were part of the film. After her movie career, she turned all her focus to her calling as a musician of the Carnatic school, and international fame followed soon. Her notable international performances include Scotland’s Edinburgh International Festival in 1963, Carnegie Hall in New York, the UN General Assembly on UN day in 1966, and at London’s famous Royal Alberta Hall in 1982. She was also actively involved in humanitarian work, and is said to have performed in more than 200 charity concerts that together generated more than Rs 1 crore. MS was also known to have given away the bulk of her prize money for social causes. In 1988, she became the first musician to win the Bharat Ratna. MS was the first Indian to receive the prestigious Ramon Magsaysay award in 1974. In 1968, she received the Madras Music Academy’s Sangeetha Kalanidhi award, considered to be Carnatic music’s most prestigious honour. In 1990, MS was conferred the Indira Gandhi Award For National Integration. Over the years, she also received honorary degrees from many prominent universities. Her fans have included the likes of Jawaharlal Nehru, Mahatma Gandhi, Sarojini Naidu, Lata Mangeshkar, and Ustad Bade Ghulam Ali Khan of the Hindustani school. MS breathed her last on 11 December 2004 in Chennai, aged 88. Among those present at her funeral was APJ Abdul Kalam, who was then the President of India. She was cremated with full state honours. On 18 December 2005, the United Nations issued postage stamps commemorating her birth centenary. In 2006, the Tirupati Urban Development Authority erected a bronze statue of her.